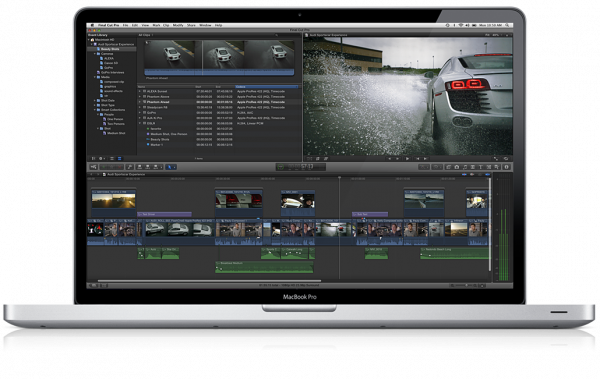 Apple today announced Final Cut Pro X, a new version of their popular video editing software. background rendering that allows you to work without interruption. Rebuilt on a 64-bit architecture, Final Cut Pro X is now available from the Mac App Store for $299.99, pricing that makes the platform an extremely competitive option. At the heart of Final Cut Pro X is the Magnetic Timeline, a trackless approach to editing footage that lets you add and arrange clips wherever you want them, while other clips instantly slide out of the way. You can use Clip Connections to link primary story clips to other elements like titles and sound effects, so they stay in sync when you move them. You can also combine related story elements into a Compound Clip that can be edited as a single clip. The new Auditions feature lets you swap between a collection of clips to instantly compare alternate takes. Final Cut Pro X is also a 64-bit app, designed to take advantage of the latest Mac hardware and software. Final Cut Pro X uses multi-threaded processing and the GPU on your graphics card for fast background rendering.